Production of thin-walled filament-wound tubes in PA 6 at TU Delft. Production of a trial thermoplastic end cap at TU Delft. 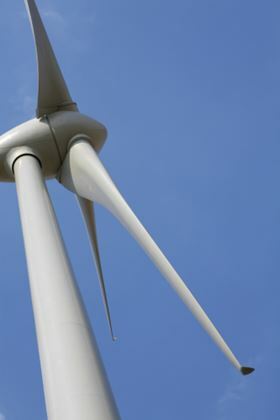 Reinforced thermoplastics offer significant advantages over thermosets when used to produce rotor blades for utility-scale wind turbines. For a start, thermoplastics are malleable when heated and remain plastic instead of setting permanently rigid as thermosets do. Consequently, at the end of service life, thermoplastic blades can be recycled by heating and forming them into something else. Given that blade manufacture now accounts for hundreds of thousands of tonnes of composite material each year, this will become an increasingly important benefit. Thermoplastics can also address the cure cycle roadblock that slows down production of thermoset blades today. In essence, their linear polymer chains do not crosslink and therefore do not require a cure cycle. Formed blades can be removed from their moulds while still hot, further speeding up the production process. Parts can be co-consolidated or joined by heating the interfaces locally and welding them. Small parts can be injection moulded from granules. Reinforced thermoplastics can be stronger for the same weight than thermosets, so permitting lighter structures. Optimising blade design for these materials might result in differently configured structures. For instance, by designing a blade more like an aircraft wing, with ribs and spars for stiffening, designers might be able to dispense with much of the structural core material used in existing blades. Foams and other cores absorb resin, add weight and cost, and must be machined to shape. Thermoplastic properties include high strength and stiffness to weight, good elongation and favourable fire, smoke and toxicity (FST) characteristics. In service, they resist erosion by rain and other precipitation better than thermosets and, in general, are more damage tolerant. Cracks propagate more slowly and, being more ductile, thermoplastics resist impacts better and tend to show damage as visible dents rather than hiding it within the laminate behind an unblemished surface as can happen with the thermoset composites normally used. It is not all upside of course. A disadvantage of reinforced thermoplastics is their relatively poor fatigue performance caused by weaker bonding between the fibres and the plastic matrix. The bond between the two is mechanical, created by shrinkage of the matrix around the fibres during solidification, rather than chemical. The normal coupling agents used to improve bonding between glass and carbon fibres and thermosets work poorly with thermoplastics. Hot/wet properties are typically inferior to those of thermosets because hot moisture can swell the matrix, loosening the mechanical bond so that the matrix can slide along the fibres. Additionally, most thermoplastics are hard to process, their highly viscous nature in the melted state meaning that high processing temperatures and consolidation pressures are required to ensure full penetration of long or continuous fibres. Costs are elevated by the need for metal tooling and high energy inputs. On the other hand, the emission of volatile organic compounds (VOCs) that accompanies thermoset processing is avoided since with thermoplastics no chemical reaction is needed for cure to take place. Therefore processing is arguably more benign environmentally. Much of the focus in thermoplastic wind blade development is on overcoming the drawbacks mentioned above. One major drive has been to develop thermoplastic resins which, while retaining adequate physical properties when solidified, are sufficiently non-viscous in the melt state to penetrate dry fibre stacks thoroughly so that liquid moulding techniques can be used. In recent times a number of suitable low-viscosity resins have been developed. One pioneer in the field is the Delft University of Technology (TU Delft) in the Netherlands. According to PhD researcher Julie Teuwen, the melt impregnation methods normally associated with thermoplastics are inappropriate for producing large wind turbine blades because of the fibre penetration difficulties and the associated need for high processing temperatures and pressures. Producers would prefer to be able to use existing techniques, in particular the vacuum infusion method widely used for large blade manufacture with thermosets today. Vacuum infusion is favoured for its moderate investment cost and its ability to produce a continuous series of large components – albeit blades have to be produced in two halves. But vacuum infusion of fibre-dense preforms requires a resin runny enough to be able to penetrate the fibres fully. Unfortunately, the high-performance thermoplastic matrices first developed for aerospace – polyether-etherketone (PEEK), polyether-ketoneketone (PEKK), polyetherimide (PEI), polyethersulphone (PES) etc, along with the lower service temperature polybutylene teraphthalate (PBT), polyamide (PA) and polypropylene (PP) etc – are normally too viscous, their melt viscosities being many times higher than those of thermosets. However, some less viscous thermoplastics are available and it has been shown that certain thermoplastics can be modified chemically to reduce melt viscosity, for example by adding metallic salts. At TU Delft, a research group led by Dr Harald Bersee has investigated a polyamide resin having an infusion viscosity of some 10 mPa s, which is 10 times higher than the viscosity of water but 10 to 100 times lower than standard thermoset resins. Anionic PA 6 (APA 6) can be thought of as a ‘halfway house’ between a thermoplastic and a thermoset because, while exhibiting the usual thermoplastic advantages, it polymerises reactively like a thermoset. Despite this, mechanical properties are not sacrificed and, unlike the case with most thermoplastic composites, interfacial bonding is strong thanks to the degree of polymerisation that takes place. APA 6 consequently has high fatigue resistance. APA 6 introduced as an activated monomer readily infuses into a dry fibre stack and takes about 30 minutes to polymerise at a temperature of 180°C. Thermoplastic composites up to 5 cm thick and having fibre volume fractions up to 50% have been infused in this way. 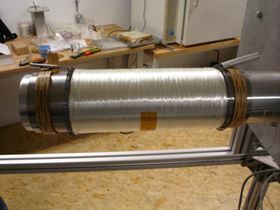 Filament wound glass fibre composite thin-walled tubes of various diameters and lengths, and small pressure vessels, have been infused successfully as trial items, and the research group plans next to produce a scale rotor blade demonstrator. Meanwhile it continues to optimise the process exploring, for example, how fibre surface chemistries and topologies can be modified to improve fibre/matrix bonding and how carbon nanofibres and nanoclays can be used to resist moisture absorption while also enhancing mechanical properties and thermal tolerance. Other new-generation easy-flow thermoplastic resins include the cyclic form of polybutylene teraphthalate (PBT) and polymerised Lactam, first developed by the GE organisation in the late 1980s. The US-headquartered Cyclics Corporation markets its CBT® products to the wind energy and other sectors. CBT 160 and CBT 500 are both cyclic resins that polymerise, in a reaction facilitated by catalyst contained in the resin, to PBT, a highly mouldable engineering thermoplastic that can be used with the usual reinforcing fibres to make composites. Advantages claimed by Cyclics include negligible production of VOCs during processing and (in the cured product) high stiffness, impact resistance, chemical resistance and dimensional stability. The resins’ low viscosity means that full wet-out of dense fibre preforms can be achieved rapidly without the need for high pressure. Exotherm during polymerisation is said to be low. Because polymerisation takes place at a temperature below the melt and crystallisation temperatures of the PBT polymer, it is not necessary to cool the tool in order to de-mould the component, a further factor shortening the manufacturing cycle. PBT thermoplastic lends itself to the production of parts both large and small, with the possibility to produce the latter by pressure moulding, thermoforming or filament winding. In Europe, Ems-Chemie AG has developed a process in which anionically polymerised Lactam-12 (APLC-12) is precursor to the polyamide PA-12. When APLC-12 is processed, polymerisation times vary from seconds to a few minutes according to the amount of activator used and the process temperature applied. Its low viscosity leads to successful infiltration of high fibre volume fractions. In Ireland, the Composites Research Unit at the National University of Galway, a team at the University of Limerick and commercial company EireComposites have taken the state of the art further. The universities have worked extensively with APLC-12 composites while EireComposites is actively developing liquid moulding for the production of thermoplastic composite wind turbine blades and nacelles. Under the GreenBlade project, in which EireComposites is leading (through its subsidiary company EireComposite Teo) a collaboration that also includes Mitsubishi Heavy Industries, Ahlstrom Glassfibre and Cyclics Corporation, a 12.6 m long demonstration blade is being developed, manufactured and tested. This work should lead naturally to the future development and certification of full-scale thermoplastic composite blades. An innovation patented by EireComposites is a tooling system dubbed MechTool (‘Mech’ for Mould Efficient Cooling and Heating), in which electrically generated heat is applied directly to the tooling in the locations where it is needed. The tooling used is able to withstand temperatures of up to 400°C, well above the 190-240°C processing range of CBT resins. EireComposites claims that using this system along with vacuum infusion and liquid moulding technology can yield a two thirds reduction in production time compared with thermosets, with consequent cost reduction. Reactive thermoplastic mixtures are not the only resin-based solution, however. TU Delft and others have also investigated the use of low-viscosity carrier liquids to convey thermoplastic particles and emulsifiers to the reinforcement. Various monomers are used in this emulsion polymerisation method, for example styrene, butadiene, acrylonitrile, vinyl chloride, and vinyl acetate. TU Delft says that a solid particle content of some 60% is achievable currently, and is working to create and test a composite based on acrylonitrile butadiene styrene (ABS). Nor is liquid moulding, whether of reactive mixtures or particles immersed in low-viscosity carrier liquids, the only route to the creation of a thermoplastic composite. Another option is the co-mingling method, in which thermoplastic fibres are mingled with reinforcement fibres. On heating the co-mingled yarn, the thermoplastic melts and impregnates the reinforcement fibres. A thorough and even distribution of thermoplastic throughout the yarn can result. Twintex®, from the OCV Reinforcements Division of Owens Corning Composite Materials, is a product of this type. Twintex roving or fabric comprises co-mingled E-glass and PE, PP, PET or PBT filaments. Consolidation is achieved by heating the roving to a temperature above the melting point of the matrix (180-230°C) and applying pressure, then cooling the result. Another producer, Comfil, in Denmark, has similarly combined various reinforcements, including glass, aramid and carbon, with spun fibres of PP, PET, PPS, PEEK and PET. Its glass fibre/L-PET material (L-PET is an amorphous polyethylene teraphthalate) is interesting because the thermoplastic has been modified to melt at 160-180°C, usefully lower than typical thermoplastic melt temperatures. This helps address concern of composites producers about the high processing temperatures required by thermoplastics. An assessment by Denmark’s Riso Technical University of laminates made using the Twintex glass/PP and Comfil’s glass/L-PET materials yielded promising results. Vacuum-consolidated laminates in unidirectional and 0/90° configurations and having 40% fibre (by volume) all withstood about 1 million test cycles, the highest fatigue strength being demonstrated by the Twintex unidirectional sample – with a Comfil 0° sample being highest in shear fatigue. Other tests showed that, using a Twintex plain weave material in laminate up to 9 mm and 18 plies thick, it was possible to produce a test section of blade, complete with interior structural webs, in a single continuous ramp-up/heat soak/cool down process. Aluminium female moulds were used for the blade shells, while the webs were compacted against the inner surface of the shell lay-up by vacuum bags. Where extra internal consolidation pressure was required, such as in the blade section’s trailing edge, polymethacrylimide (PMI) structural foam from Evonik Degussa (Germany) satisfied the requirement, expanding when heated to exert the necessary pressure. Among the several blade manufacturers keeping a close eye on this work is Denmark’s LM Glasfiber, one of the world’s largest producers of wind turbines. This company, in normal times scarcely able to produce blades fast enough to meet demand, wants to halve current production cycle times as part of its latest blade technology development programme, Blade King. It is attracted by the reduced cycle times promised by thermoplastics, which it sees as a probable key to bringing ‘new types of material to the market by 2015’. In order to produce the immense blades expected to be required for future offshore turbines, high levels of automation are also likely. This is why another Blade King focus is the use of techniques such as robotic fibre placement or tape laying to speed up the process of laying fibre into the mould. Working with LM Glasfiber on Blade King, with part sponsorship from the Danish National Advanced Technology Foundation, are Riso DTU and Aalborg University. Teun Hulskamp, another researcher in the Faculty of Aerospace Engineering at TU Delft, considers that, as blades become ever larger, structural redesign is inevitable, with thermoplastics a key enabler. Although the structural form Hulskamp advocates involves the use of more individual parts, the fact that thermoplastics can be fusion-bonded (welded) to make an integral whole makes it viable. Thermoplastics can be melted and cooled without loss of properties, so parts can be joined by fusing their contact interfaces under heat, then cooling and consolidating under pressure to form the required bond. One promising method for accomplishing this is electrical resistance welding, a process that is relatively simple, requiring low-cost tooling and little or no surface treatment. The team at Delft has explored the parameters involved and developed a process for resistance welding thermoplastic composites such as carbon fibre-PEEK and carbon fibre-PPS. Their process involves applying heat to the two laminates to be joined via an electrical heating element interposed between them. The element becomes part of the joint, an advantage of this approach being that, should inspection reveal a flaw, the joint can be reprocessed. Temperatures required for welding carbon-thermoplastic composites are said to be significantly lower than those for similar matrices reinforced with glass fibres, due to the difference in fibre thermal conductivities. Another Netherlands-based organisation actively developing techniques for welding thermoplastics is Kok & Van Engelen Composites BV, a commercial company that has patented a welding process for joining carbonfibre reinforced thermoplastics. KVE’s innovation is to generate eddy currents in the electrically conductive carbon fibres so that the laminate is heated from the inside. Currents are generated inductively by moving a coil up and down the intended weld line so that the thermoplastic matrix is melted locally. Parts to be welded are positioned in ‘special tooling material’ that is both transparent to the electromagnetic field and has reasonable thermal conductivity. No external materials are used in the process and the weld line, examined under a microscope, appears as a single consolidated laminate with no evident phase boundary between the two original parts. To suit series production of large components, materials handling and movement of the coil can be automated. Process parameters, set according to such factors as fibre volume fraction, will be monitored and controlled continually. The company believes its technique will facilitate fabrication of the very largest blades intended for turbines destined for offshore use or for low-wind locations on land. These are the blades in which carbonfibre reinforcement is expected to have a growing role. Also in the Netherlands, Stork Fokker and TenCate Advanced Composites BV, along with airframe giant Boeing, are establishing a Thermoplastic Composites Research Centre at the University of Twente. Although aerospace will be a prime focus, activities will also target other end-use markets, including wind energy and automotive. The overall aim is to develop sustainable and cost-effective methods of production. Stork Fokker has already produced demonstration thermoplastic items using KVE’s induction welding technology, and is developing parts for new-generation aircraft. Best estimates suggest that in 2007 world production of wind turbine blades exceeded some 43 000 units - double the number produced just two years earlier. Production could, it is thought, triple over the next decade, despite the present economic downturn. Small wonder that, as well as expanding their manufacturing facilities, blade suppliers are seeking to speed up production processes so that they can meet future demand. Thermoplastics can potentially help them do this, while also enhancing the structural viability of very large blades and addressing the issue of recycling after first service life. For the wind energy sector with its increasingly stringent demands, these true plastics could prove to be a transformational technology.